It's a gloomy, drizzling afternoon here in New York and the clock has barely clicked 5 and it's already pitch black outside. So to cure the slightly depressing mood, I've heated up a scone from Alice's teacup, made myself a cup of tea and for lack of better things to do, decided hey, maybe it's time to join the masses and see just why everyone nowadays is blogging. And so, tada, here I am. 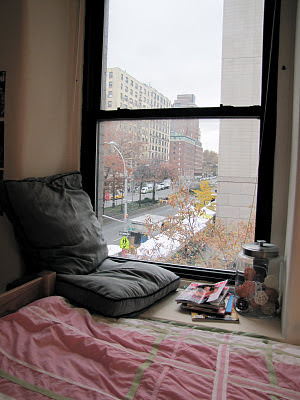 So I'm sitting here in this slightly-too-big-and-too-comfortable-to-be-condusive-to-any-work-butterfly-chair of mine, looking around for inspiration and decided, why not do a post about my room. I've heard somewhere that a person's bedroom is very telling. So it seems apt that this be my very first soul-baring post. 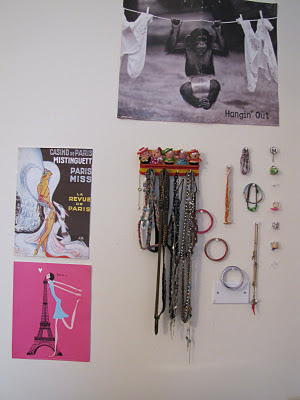 1) My favorite corner in my room. Complete with stacks of magazines and twinkling Christmas lights bottled up in a jar. 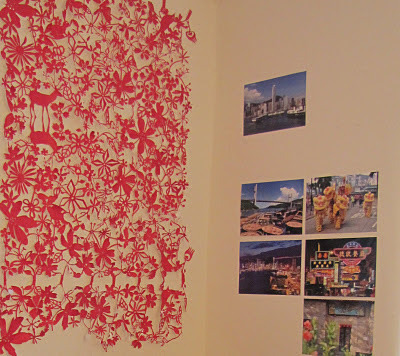 3) What I wake up to every morning--beautiful red paper cutout and photographs of home. 4) And lastly, just a little holiday cheer to look forward to.